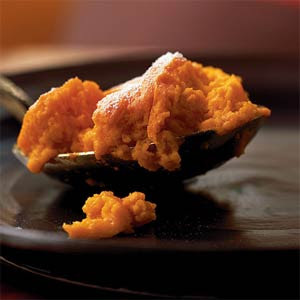 This carrot souffle is a tried and true recipe and has become a permanent addition to our Thanksgiving dinner. I was first introduced to this side dish when interning in Washington, D.C. in college. A family living in Alexandria invited over a friend, who invited several of his friends, and lucky for me I was able to enjoy this very memorable experience. You can make one large carrot souffle or several individual souffles in ramekins. It's the perfect replacement for the yams we suffered through for so many years :) I've never seen anyone turn it down...added bonus! Click here for the carrot souffle recipe. Dust it with a little powdered sugar just before serving. my carrot souffle is in the fridge, ready to be baked tomorrow! it's on the favorite list here, too, after discovering it 5-6 years ago in cooking light. LOVE it. and like you said, it's a perfect replacement for the yams we grew up on! Yum, I have had it at Cher's house before.